I have a couple of the more well known rotary tools but they always seemed underpowered, especially when you put router style cutters in them. I had read when these first came out about them having much more torque for that type of work. I think these are one of the best things this company has made in years. I have one that I’ve been using for four years or so, its held up well enough that I have a couple backups. I’ve run router cutters in carving setups and you can really hog off the wood with this tool. I recommend it to anyone who asks about a rotary tool by its more well known name. It takes all of the dremel brand accessories that I’ve tried on it, router base, flex shaft, collets. Its labeled a three speed but it actually has steps in between the low, med, high. To make no mention of the price difference, its not often I get to spend less for more. Thats my opinion, take as needed for pain. got a Dremel years ago, thinking it would help me with carving but it lacked in every-way so when I was given one from Black and Decker I didn’t think too much of it but boy was I wrong. got a flex shaft also and it really is like drawing with a crayon. mine is an older model, don’t know if that helps or not. I’ve had this one for several years and it has been perfect. I have the flex shaft as well as router and grout attachments. Never had any problems. I have both the Dremel and the B&D, and both are nice. The B&D can handle all the Dremel accessories (and I have a lot of them) and has almost as much power. (The amperage ratings slightly favor the Dremel, as I recall.) It has been a while since I purchased mine, but I think I paid about $25, which is considerably less than what I paid for a Dremel package – which admittedly came with more accessories than the B&D. One thing the Dremel does have going for it (at least my particular Dremel) is the ability to fairly easily change out the brushes. No such easy access is possible with the B&D. However, the brush covers for the Dremel are flimsy and I have to keep a thick rubber band wrapped around the body to hold the covers solidly in place. Of course, the B&D brushes will probably last a long time, anyway, so the lack of access is no big deal. I also own a very old Sears version that will take few Dremel accessories, but it still comes in handy for some basic projects. A photo of all three is attached, and you can see the rubber band around the Dremel. I have this Black & Decker tool at home and a Dremel 3000 at the office. 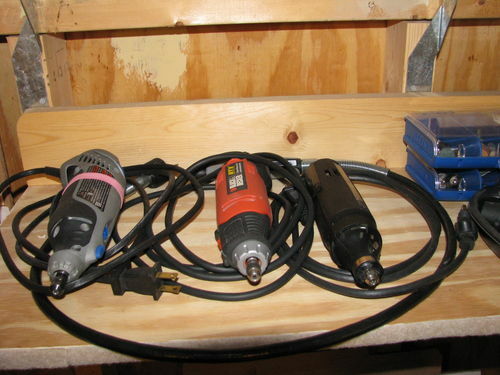 The Black & Decker has more power at 2 amps versus the Dremel 3000 at 1.2 amps. I’ve had it for a couple of years now. It sees occasional use, but has been great so far. This tool is made in China, while the Dremel is now made in Mexico. All the while I was burning throuh the consecutive life-spans of three Dremel rotary tools, the most recent of which had a digital read-out and controlled speed, I decided the quality of bearings they were using was declining. At the same time, I was of the general oninion that B&D quality had been compromized a long time ago. But when the digital Dremel got fried, I picked up a B&D rotary tool at a yard sale and was very pleased. The B&D bearings seem to be higher precision than what Dremel is currently using. There seems to be much less runout and bearing noise. Today, I’ve got two B&D rotary tools and my first two Dremels. One of the Dremels constantly has a flex shaft attached and the other is always connected to a right angle gear box. In both of the latter cases, the attachments nullify the problems with the Dremel’s worn bearings.